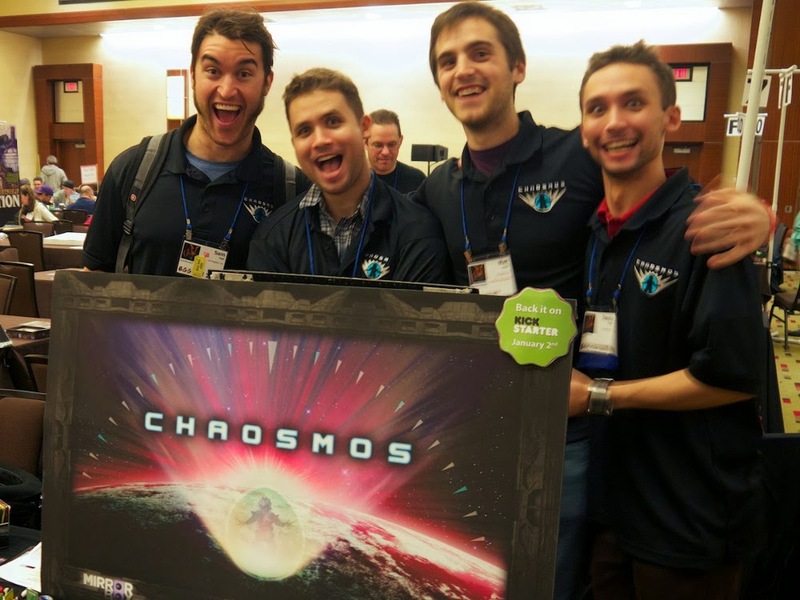 You might have heard some of the buzz about Chaosmos, an exciting new game that’s rich in both story and interaction. Joey Vigour and his team at Mirror Box Games successfully launched their Kickstarter for Chaosmos and are already over a third of the way to their goal within the first 24 hours! Joey kindly took some time away from his hectic launch schedule to answer some questions about his “Dream Project”. Let’s start off with a brief description of Chaosmos, something that will both excite sci-fi enthusiasts and convert those who wouldn’t dare play a “space game”. Chaosmos is, at its heart, a treasure hunt. It’s a timed treasure hunt, and if you don’t get the treasure in time, everything that matters to you will cease to exist. It’s riveting. It’s like being inside a movie while it’s happening, but instead of feeling helpless, you feel powerful. All the cards in the game are good, but only situationally, so you will have to outwit your opponents, not just out play them. Chaosmos is highly thematic, but it’s really more about being given freedom, and the theme is less about pretending to be an alien spy as it is about feeling a sense of dread, a sense of scrambling to control the chaos around you. The game is, in short, fun. What is your background in gaming and what are some of your favorite games? I primarily like science fiction games, so I appreciate rich themes and psychological interaction over games featuring a lot of math. I like Twilight Imperium, especially the “hidden roles” aspect of the Fall of the Empire scenario in the second expansion. I love Dune/REX and I love about 50% of my Cosmic Encounter games, based on who I’m playing with and the aliens we use. 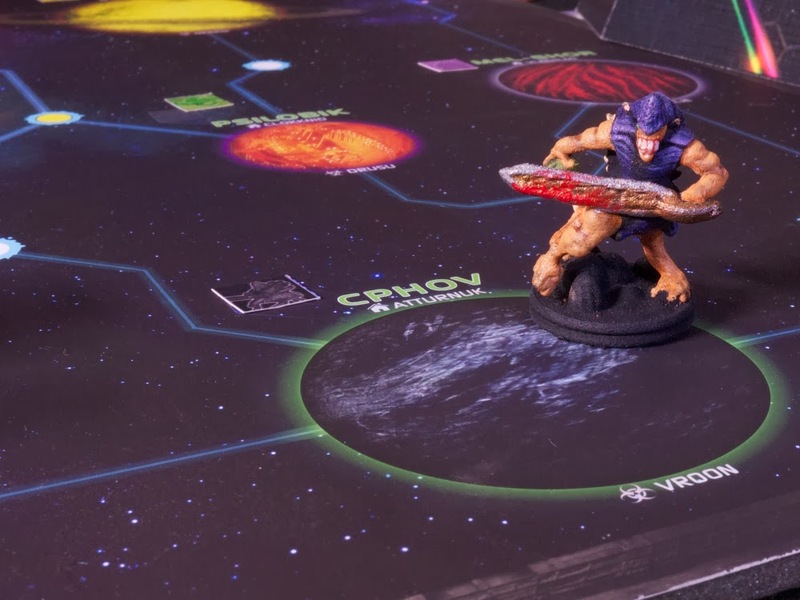 I am getting into the miniatures game Infinity, which takes place 175 years in the future. I also like Race for the Galaxy and Among the Stars. Even though they are both very mechanics-driven, the art and theme for both games is great. I actually spend most of my gaming hours testing prototypes for my other games. I have several in the works that I’m really excited about. Some of the games you listed (Twilight Imperium, Dune, Cosmic Encounter) seem to have similarities in setting and grandness to Chaosmos. 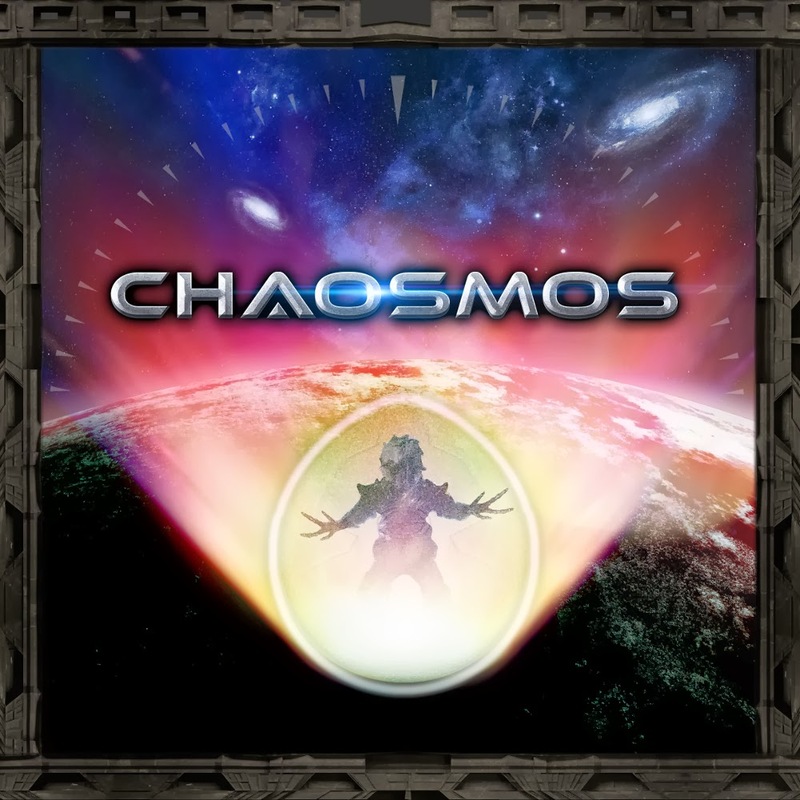 Did you draw inspiration from those games and what do you think sets Chaosmos apart? I love many types of games, but something about the stars just excites me. It’s the wonder of the unknown in its truest sense. We don’t know what is out there or what is possible in physics. The space games you mention offer the chance to play out something epic, something alien, but also personal. It doesn’t have to be a sci-fi setting. Lord of the Rings is the same, and that’s why so many great games exist in that world. Chaosmos has simple mechanics (land on planets, figure out how to use the cards you find, and capture the Ovoid), but its story is as epic and intense as the players allow it to be. We create a world and drop players into it. Hopefully they find the experience valuable as well as fun. You’re gearing up to publish your first board game through Mirror Box Games. What has your journey been like to get to this point? I loved games as a kid, and spent all my time making board game prototypes, and later about 50 text-based games in Basic, and eventually collaborated with others to make graphical games in the World Builder environment for Mac OS 7. We posted them to message boards back in the mid 1990s, which was about as close to “publishing” games as we could get, although getting support and feedback from the early online gaming community was wonderful. Chaosmos is my dream project because it is the one that has most inspired me over the years. It was loosely inspired by a book about aliens called Interstellar Pig. That book really opened my eyes to how big the universe truly is. I’ve tried so many different combinations of cards, alien powers, maps, and mechanics. But I keep going back to the Chaosmos theme: the universe is collapsing. That’s a pretty major launching point for a game’s story. It could be interpreted as light or as heavy as you want, but for me it’s powerful. What would a culture do if it knew the whole universe was ending? What finally got you to dive in the deep end and start your own company? We decided to form a publishing company because the game is so rich with interesting mechanics and a cool mythos, and I wanted to play in that sandbox for a year or two and see what I could dig up. I can’t wait to publish the game, and I’ll be excited to see if there’s demand for expansions. I also have so many other game designs I’m falling in love with as well! 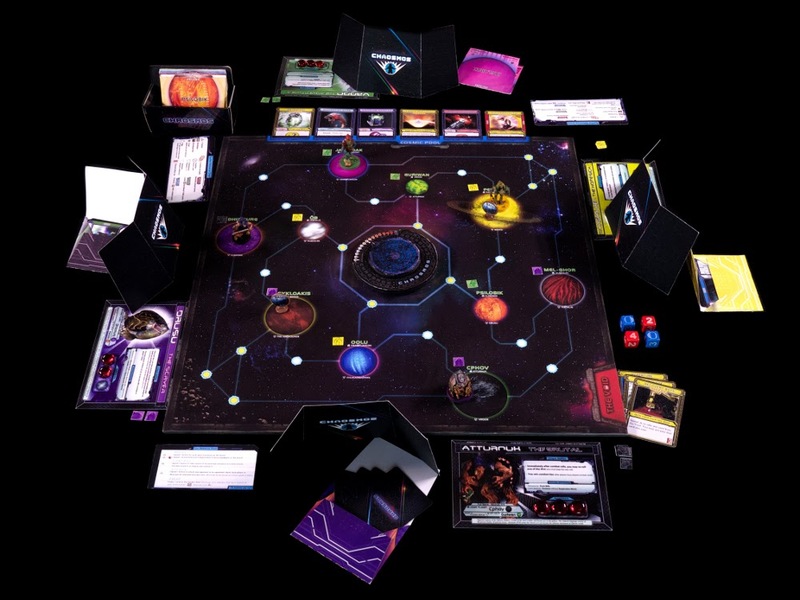 It seems pretty clear that Chaosmos is all about telling a rich story and getting the players to experience it and share that story after the game is over. How does the game go about fostering this and what design choices did you use to create this experience? It’s all about creating emergent narrative; the story isn’t imposed by a linear objective, it evolves based on player interaction. Create a simple but effective system (in this case, 10 “lockers” that contain cards) and let players explore and take the cards. By imposing a hand-limit of 7 cards, players are now forced to make hard choices. They will have to leave cards behind and come back for them later. All players have the same goal, so they will start to communicate. They will start trading. They will start lying to each other. This happens naturally, it isn’t imposed by the rules. This is emergent narrative and it’s my favorite part of board games. I’ve heard the feeling of Chaosmos compared to the Cold War. This seems appropriate since the rules state that “your most important weapon is to bluff, misdirect, and deceive.” Can you give some examples of when and how players might employ such tactics? You either have the Ovoid or you don’t. If you have it in your hand, you are weaker, since it fills up your hand. If Bill is going to land on Guriwan, but you stashed the Ovoid there, you are in a bind. If you Hyperspace over and get it back, everyone will suspect you have it because you used a precious teleport. Perhaps there’s something you can say to Bill to convince him not to land there. For example, maybe convince him you left a trap there, or offer to meet him somewhere to trade enviro-gear so he can go to his toxic planet. But don’t get too desperate– if Bill is going to land on Guriwan no matter what, it’s better for him to get the Ovoid (but no one other than you knows he has it) than it is for you to give away to the other players what you and Bill know. Now you have possibly three aliens to contend with, not just one. Since the game ultimately boils down to holding the Ovoid, knowing its location is very important. What tools do the players have at their disposal to find it? How does the game keep the hunt for and defense of the Ovoid exciting and meaningful without broadcasting its location? Pretty much every card in the game is good, and they do all kinds of fun and interesting things. There are scrying prisms that let you remotely search planets and players’ hands. Each time you win in combat you get to look at the losing player’s hand, so weapons are partly a means to get additional information. Players leave landing markers when they control a planet, so you can follow their breadcrumb trails and deduce what they are up to. Sometimes one player won’t have figured out what is going on, but generally it’s because that player was distracted by trying to collect three spores or build the ultimate base on Pendra. The best part of sandbox games is that you can do whatever is fun for you, even if that means neglecting your goal of finding the Ovoid. Usually, unless players are very good at bluffing, most information is revealed towards the end, resulting in epic battles or surprise wins with the Temporal Displacer. What allows each game of Chaosmos to feel unique? Are there different experiences from game to game or is the variation more in how the players choose to interact? It’s one of the most replayable games I’ve ever experienced. It truly depends on the personalities playing. My friends know I don’t like combat as much as deception, so I try to outmaneuver them or ambush them on a planet when they are weakest. Because of the closed ecosystem of cards, each action you take has ripple effects that change the strategies other players were building towards. The alien abilities also interact in unexpected ways. Every game is different. 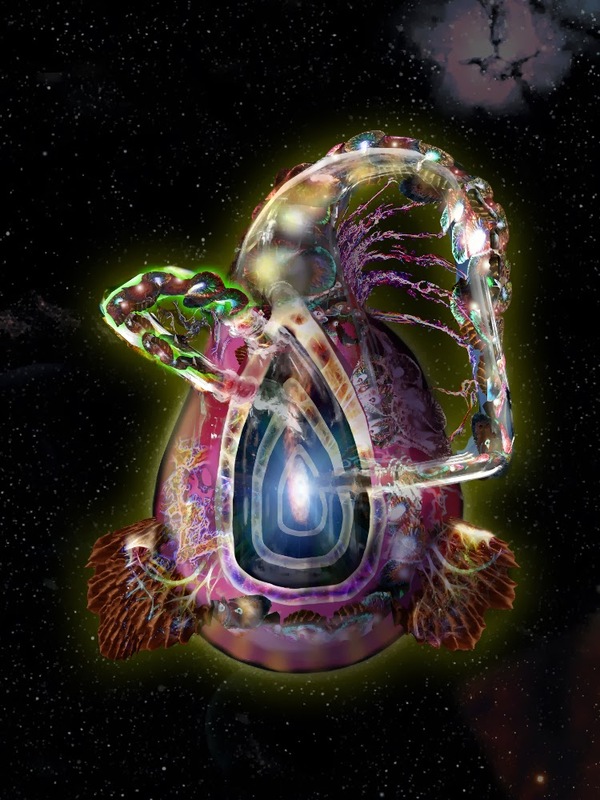 The art and models in Chaosmos are very vibrant and creepy from the aliens to the Ovoid itself. Did you draw inspiration from anything or anyone for this graphical direction? I’m lucky to be working with an artist (William Tombs) who is also the co-creator of the game’s mythos. I tell William what type of alien or equipment I need and he instantly knows what it is, how it works, and what it will look like. The Ovoid art was a collaboration between William and my brother Danny. William sees the Ovoid as an egg with swirling galaxies in it. Danny interpreted the Ovoid more like a Klein bottle (a three dimensional closed object that has no exterior or interior, just one surface). I am not sure if either is correct– the Ovoid is just a MacGuffin and it sort of has no explanation other than itself. I’d like to hear a little bit more about your background and interests in general. Your bio on the kickstarter page mentioned that you have edited over 1000 videos (that seems like a lot) for Discovery and other major networks in addition to producing and editing several documentaries. Is that something you’re still doing and passionate about? What have been your favorite videos or documentaries that you’ve worked on so far? I’ve worked as an editor in the development of new television shows, and casting reality shows, since 2007. Sometimes I’ve edited 5 interview reels a day, each 2-3 minutes long. So 1000 is actually a conservative estimate of how many I’ve cut over the years. I try to tell a whole story, or fully reveal the complexities of the interviewee within those two minutes. It’s a job that’s impossible to do unless you love story itself, and I find ways to love even loathsome people, so you can better tell their story. I’m most passionate about a documentary I directed a couple years ago, about an inventor. He designs amazing machines, and the movie documents his creative struggles and his efforts to change the world. Is there anything else that you’re interested in outside of editing and board games? In my non-gaming time I love watching movies, especially Korean and Japanese cinema. I try to stay healthy by playing Ultimate Frisbee, which is something a lot of gamers I know in Southern California do to stay in shape. One last question, what can people do to help make Chaosmos a success? Share with your friends. Just because a project is popular at the beginning doesn’t mean it is reaching all the people that will love it. Get it out there to everyone so we can share in the Chaosmos community together. And follow us on Twitter @MirrorBoxGames. Thanks again to Joey for taking the time away from his campaign to answer some questions. Make sure to check out Chaosmos on Kickstarter.